A planogram is a visual diagram, or drawing, that provides in detail where every product in a retail store should be placed. At a higher level the "macro space" or commodity layout specifies where in the store different categories are situated and how much space each category is given. 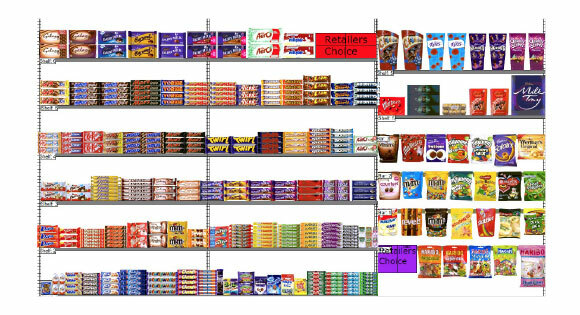 The "micro space" or the planogram, then identifies where each individual product is situated within its category and how much space and facing each product is allocated. Planning this macro space appropriately can be critical to the profit margin mix and sales each store can achieve. Then how products are merchandised at a micro space level is critical to ensure your customers can easily find what they are looking for and that operationally you have allocated the correct amount of space to each product. Too much space to a category or individual product simply ties stock up and effects your cash flow. Too little space can cause operational challenges to stay in stock on the shelf and can lead to disappointed customers who will shop elsewhere if they cannot rely on you being in-stock or they simply cannot find what they are looking for as the displays are cluttered and the store awkward to navigate around. The old analogy of "less is more" has never been more true than when it comes to merchandising planograms. Have enough range that you have a broad range of goods but don't over complicate things by providing multiple products that simply duplicate the offer without providing a point of difference. If there is the space to offer a "good, better, best" range then this is ideal but for many small independent stores, a leading brand and a value offer is often all that is required to meet your customer's needs.